The first 7 years of my life were mostly spent in Iowa, but after that I have circled the globe so many times I can’t even count it. Yet, oddly, the site of a John Deere tractor still feels like home to me. When I see rolling fields with perfect rows of corn and beans, or the smell of hogs, it just feels like home. 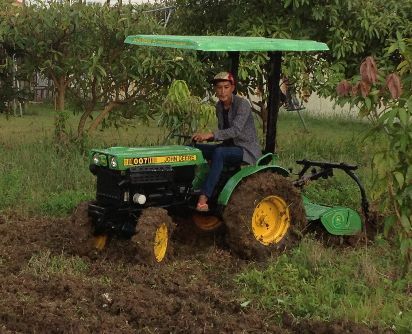 So, the other day, I needed to buy a little tractor for our vegetable farm here in Cambodia, but they only had little used Kubota tractors from Japan. Well, that’s all I could afford. 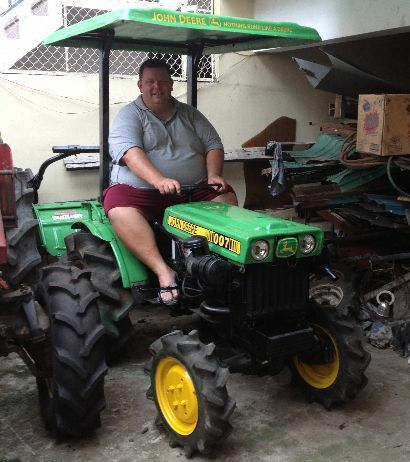 I felt like a traitor buying a dinky orange tractor rather than a manly John Deere, so I asked the seller what he could repaint the tractor in green and yellow. . . proper tractor colors. He thought it was so funny he did it for free. Thus, my Kubuta became an adopted John Deere. Hence the number “007”! Undercover Kubota! Then, a week later having played in the dirt for a week with my newest John Deere, I had another epiphany! I have been wanting a new motorcycle, but couldn’t afford it. So, why not just throw on some paint and stickers and make my Honda 250cc XR into a John Deere. 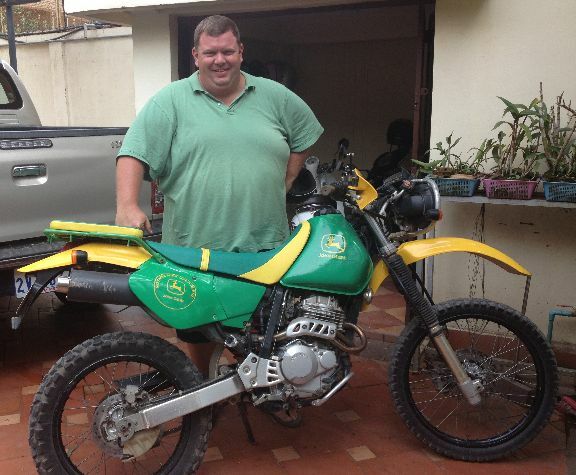 Thus, a John Deere dirt bike was born. . . customized for as much as $30 could get me in Cambodia! Some things just feel like home. But Iowa and the John Deere heaven are so far away. So, why not change the environment around us to make it become more like home? Now when I go to work everyday, it just like playing in the dirt at home.